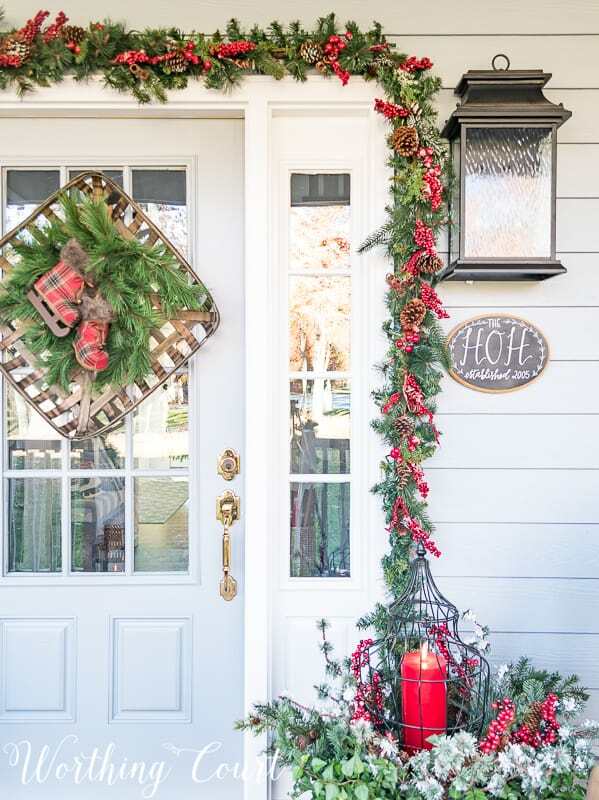 Decorating for Christmas doesn’t have to be complicated! 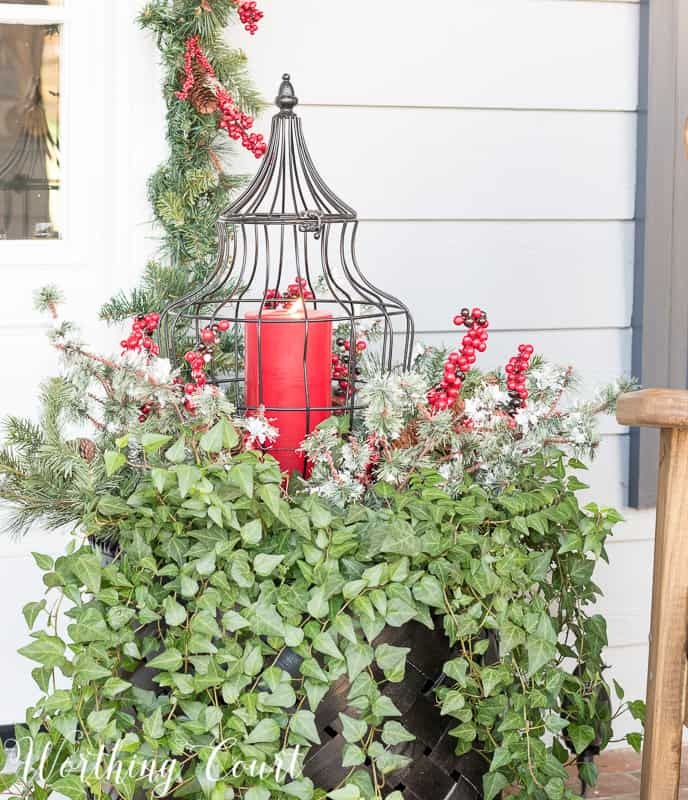 Let yourself be inspired by my easy ideas for creating a festive and welcoming holiday front porch. Hello everyone and welcome to my festive and cheery Christmas front porch! I’ve kept the decor simple this year, but nothing is more cheery to me at Christmas than lots of red and green. 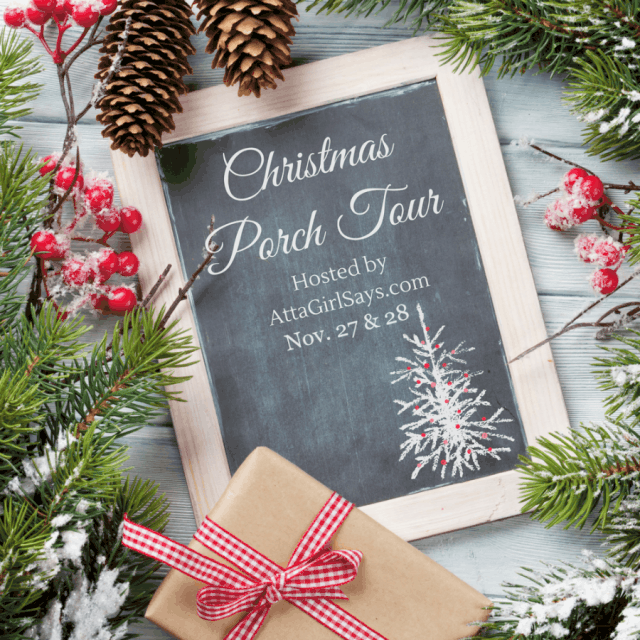 I’m delighted to be participating in the Christmas Porch Tour again this year, hosted by Amy from Atta Girl Says! Amy has gathered a group of some of your favorite bloggers for the tour this year. You’ll find links to everyone’s blog posts at the bottom. When I started decorating my home for Christmas this year, I knew from the very beginning that I would be incorporating lots of red and green. I would be using loads of greenery, ribbon, red ornaments, pine cones and berries. All of the elements that say Christmas to this girl’s nostalgic Christmas heart. I started off by reusing the garland that I made for last year’s Christmas porch. It’s made from inexpensive faux greenery garlands that are wired together. I added white lights and then tucked in red berries and pine cones. 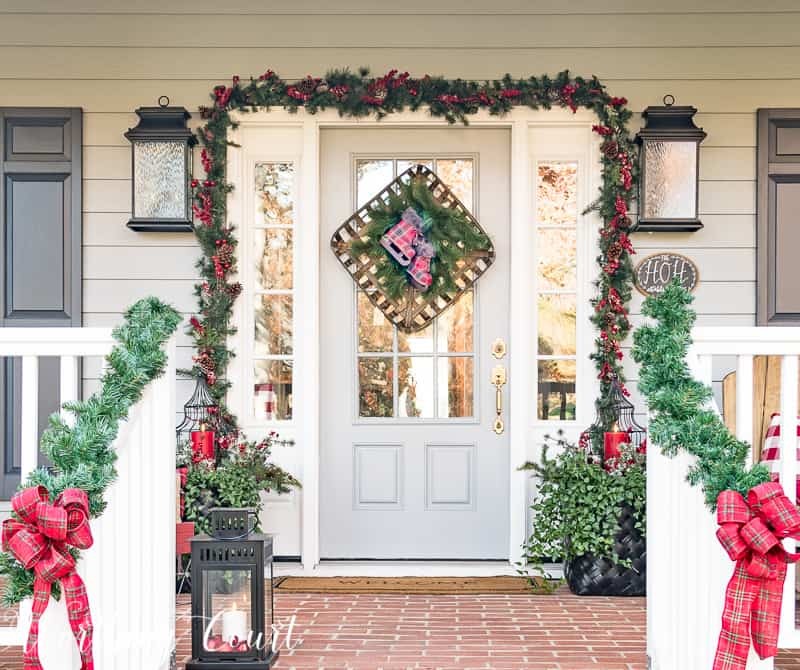 It frames the front door perfectly and sets the stage for a welcoming entry. My black planter baskets stayed too and I even left the ivy that I had planted for the summer in them. All that I needed to add for Christmas was a lantern filled with a large red candle and a few bushes of faux Christmas greenery. I first used these lanterns on my porch decorated for fall and they were a huge hit with y’all! Affiliate links have been used in this post. I only recommend products that I love. See my full disclosure HERE. My non-traditional Christmas “wreath” was inspired by a pair of adorable fur-trimmed plaid skates that I came across at At Home. Y’all know I love me some plaid! The basket is suspended from a large suction cup hook that is attached to the glass in the door. 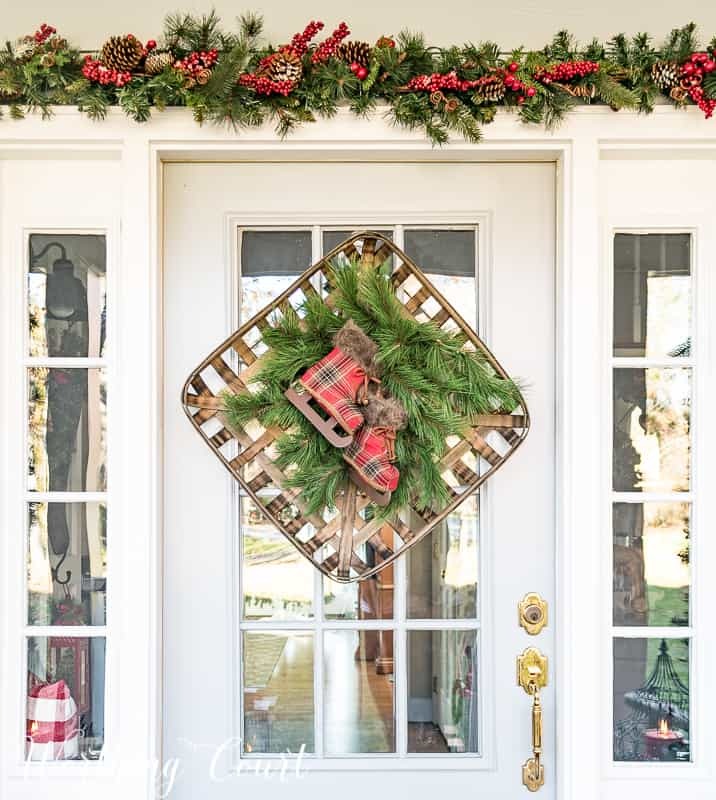 To create the “wreath”, I turned the basket on the diagonal and tied two bushes of pine branch greenery and the skates to the basket with twine. Super easy! In case you’re interested, my door is 36″ wide and the tobacco basket is 24″ square. Who doesn’t love a little red wagon at Christmas? I filled this vintage looking little guy with a Merry Christmas pillow and a fun pompom garland. 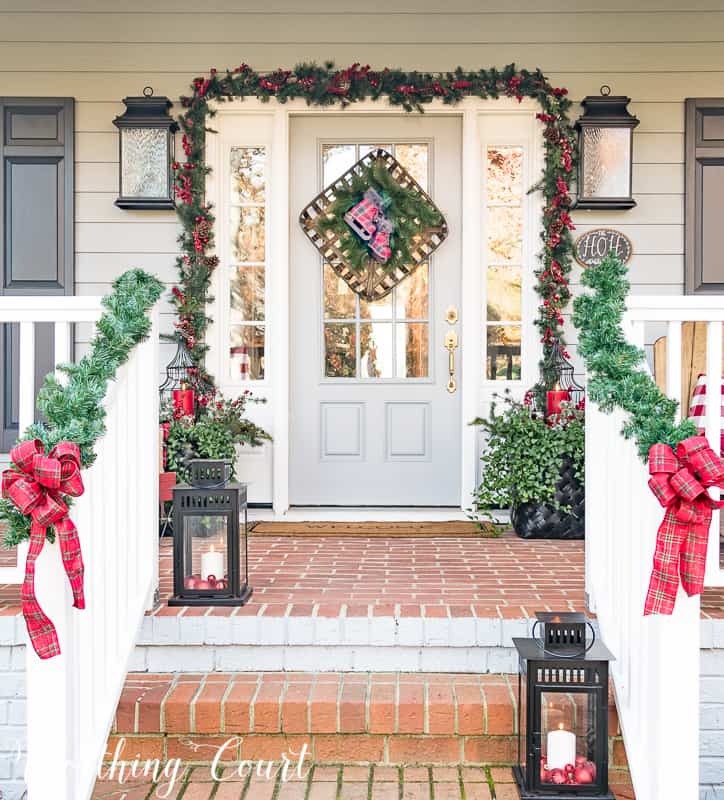 Lastly, I added one more layer to complete the porch – lanterns with candles and red ornaments and a length of garland and plaid bows to the railing on each side of the steps. 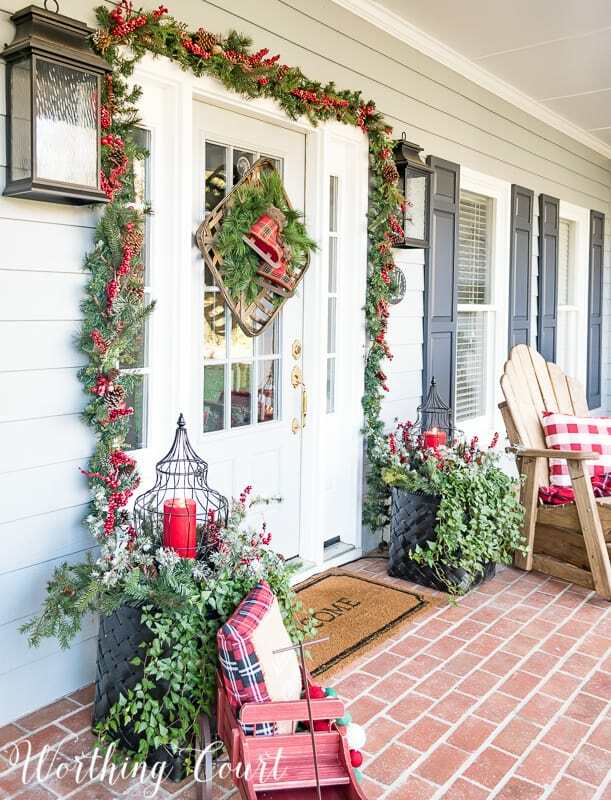 The garland on the rails and the garland framed door are meant to draw you right in! 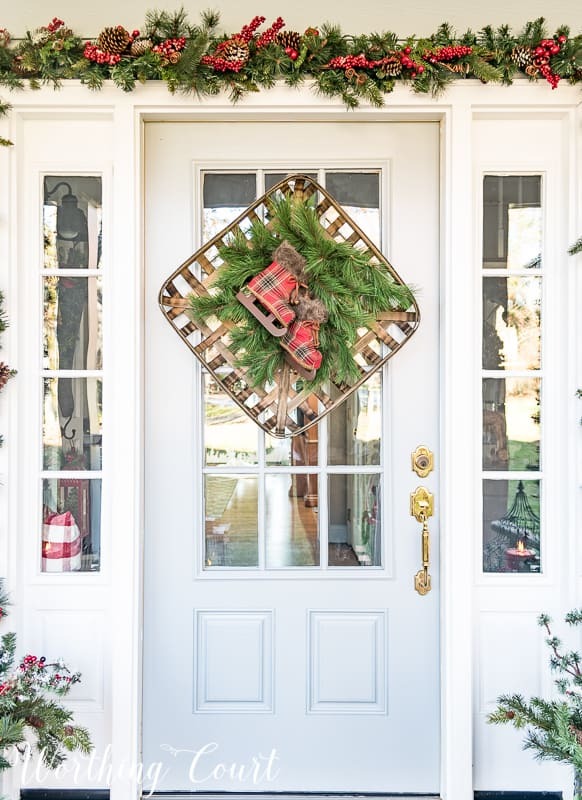 CLICK HERE TO TOUR LAST’S YEAR CHRISTMAS FRONT PORCH! Your porch looks so inviting! There’s nothing like red and green as a color combination for Christmas. 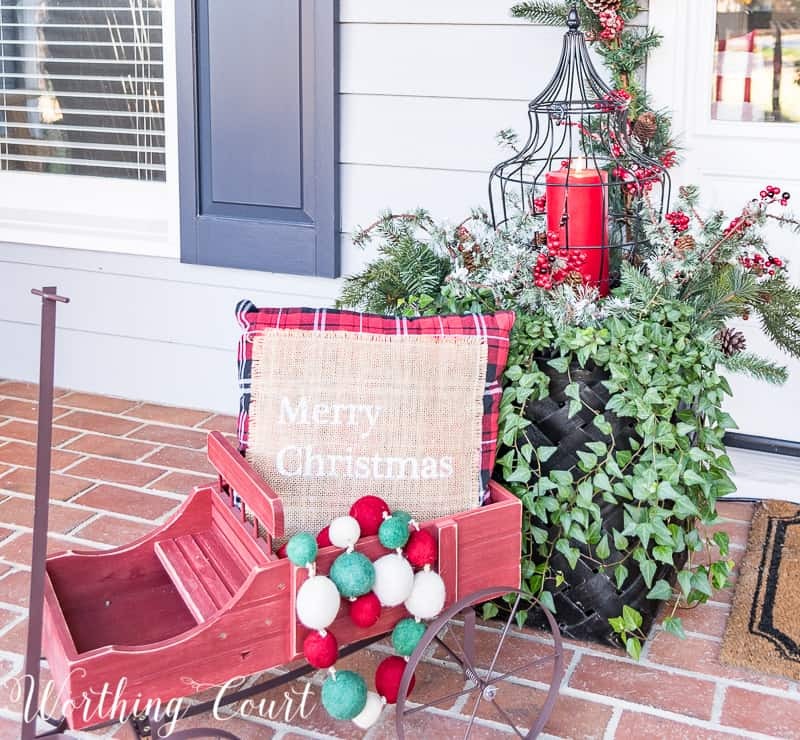 I love how you used a tobacco basket as a wreath and the red skates on it are adorable. I hope this week kicks off a fabulous Christmas season for you and your family. Gorgeous! Love the tobacco basket and the skates and just about everything!!! Great job! I love your front porch! 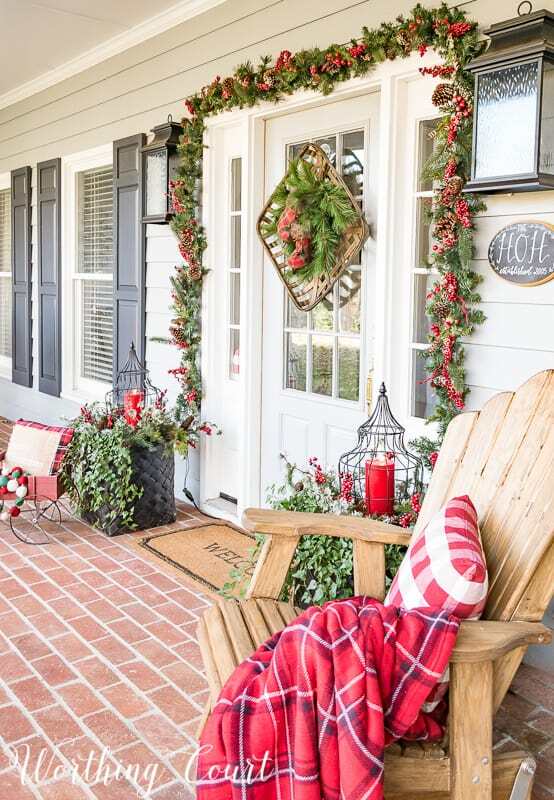 Hopefully my next house will have a front porch that I can decorate for the seasons. Thank you so much, Beverly! I found the pompom garland at Target last Christmas. I’ve linked to a similar one in the “Shop The Look” section of the post. The pompoms are smaller, but the colors are the same. Merry Christmas to you as well! 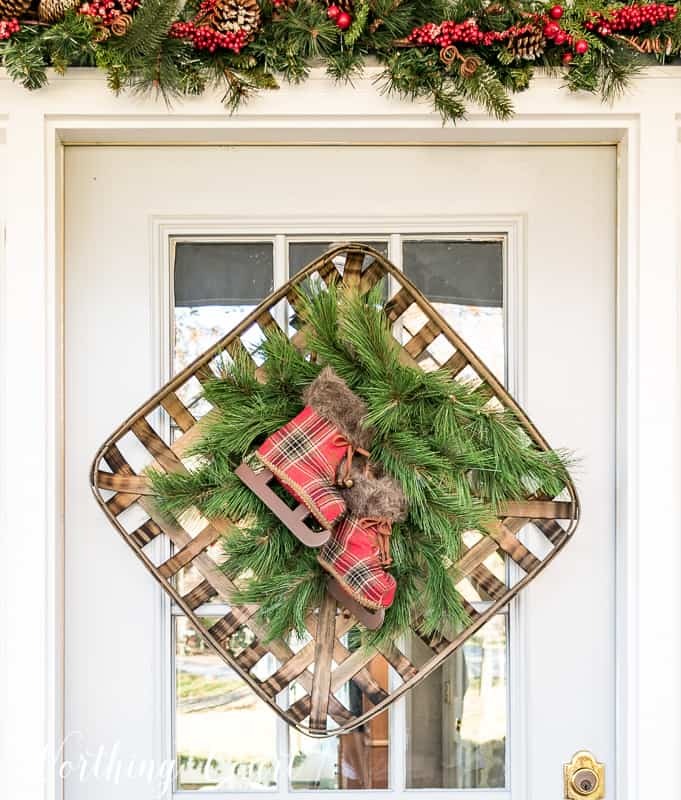 Love, Love, Love your front porch! The plaid skates are the cutest! Love your porch!! And thank you for flying the flag! My husband and son are veterans and it means so much!! It’s so pretty, Suzy. I’m so glad you could participate in the porch tour, after all! Wish I could be sitting in one of those Adirondacks right now, sipping hot chocolate, instead of crazily trying to deck these halls! And I thought I had enough ice skates until I spied those plaid ones on your wreath. They’re darling, and the wreath is so clever. I pinned lots of ideas! I love the skates in the wreath!! Your porch is beautiful!!! Happy Holidays! 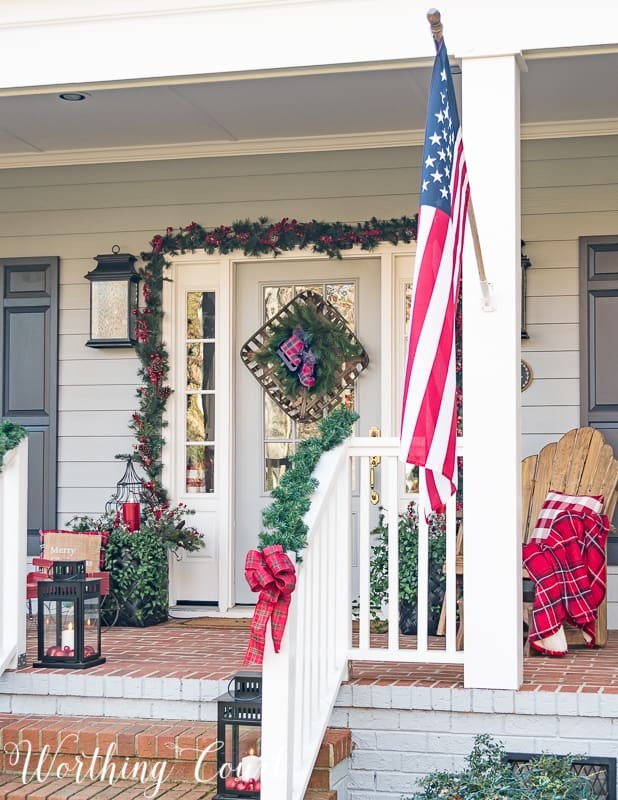 Love love your front porch and everything you’ve done to it this year. I could sit on it all day and never get anything done! Adorable. I love plaid too. The skates are darling. We have wheels in the garage to an old buggy of some kind. I’ll have to get my husband to build a darling wagon since I’m now inspired by yours. It’s all darling, Suzy. is there a link for the lanterns in the urns. they are great! Hi Donna. I’m afraid that I don’t have a link for the lanterns that are in the urns. I found them at a local store on clearance last year. Sorry I couldn’t help you! I love what you did with the tobacco basket! Beautiful!! I wish I had a porch that big!! I have a little step at my entrance, but hopefully that will change early next year! Very festive! Love it! I absolutely LOVE this porch!! It is so festive and the decor items you used are wonderful! I also decorate the front door area & front courtyard of my house and love seeing what others do outside. This is sooo pretty! I really love the lanterns with the ivy. The tobacco basket is also a great idea. Suzy, using the tobacco basket as your “wreath” is just genius, and the plaid skates are darling! *Note to self-I must get a tobacco basket! We live in a area that once grew a LOT of tobacco. Leo even worked on his uncle’s tobacco farm when he was young. Those platform Adirondack chairs are very interesting to me. We have some chairs in the yard, and when they go kerplewy, I’ll replace them with platforms! 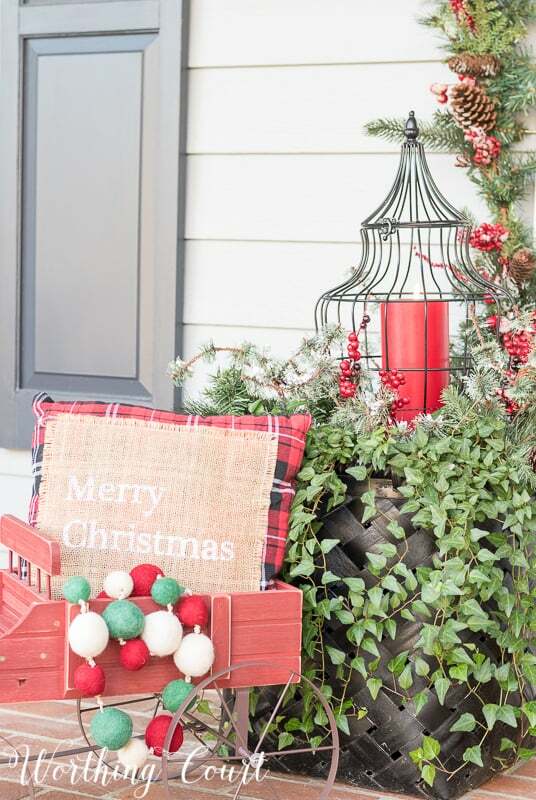 Love your entire porch decor! Love the look of the tobacco basket. I love that you stuck with traditional Christmas colors. What a great idea with your planters as well. I have been moving mine off of the porch for years! They get heavy when the rains come, I will use your idea in the future for sure. Pretty mix of plaids, greens and homey accents too. Wow, Suzy. 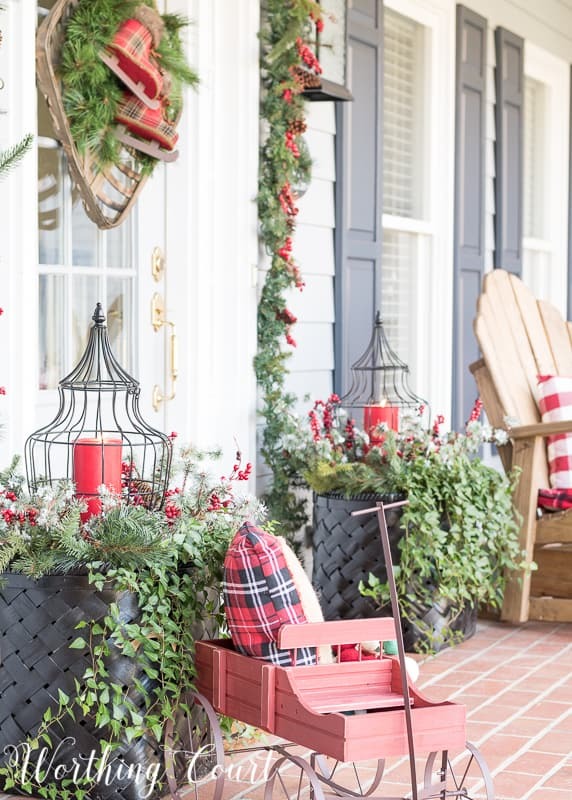 So much to love on your beautiful porch! I think my favorites are your “wreath” and those classic black lanterns. Very festive and welcoming! Hi Suzy! I love everything about this! Where did your Adirondack chairs come from? Hi Suzy, I love your front porch! It’s so inviting. Those plaid skates are adorable. Merry Christmas! I love your front porch decorations. I don’t think I can pick a favorite, it all comes together perfectly! 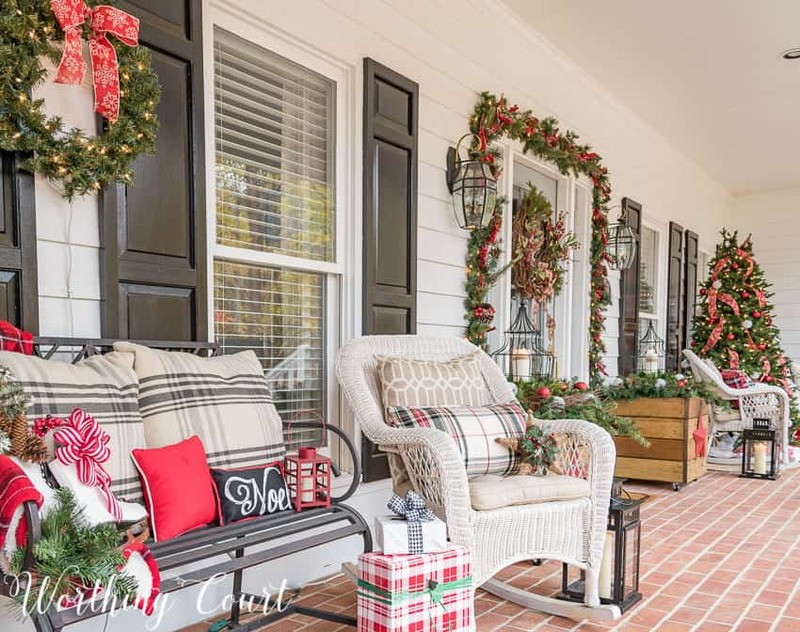 Such a warm and inviting front porch! Loving the plaid you incorporated, especially those skates on the tobacco basket. Such a beautiful space! Love the tobacco basket and the ivy in the pots! Just adorable!!! Where did you find the red plaid skates? I just love them. Thank you, Karen! I found the skates at At Home last month.